Scientists from the Rice University have discovered that the toughness of fracture-resistant “rebar graphene” is more than twice as that of pristine graphene. Graphene is a sheet of carbon with a thickness of just one atom. Although the material is tougher than steel on the two-dimensional scale, since it is very thin, it is prone to tearing and ripping. Rebar graphene is the nanoscale equivalent of rebar, or reinforcement bars, in concrete where embedded steel bars improve the durability and strength of the material. In rebar graphene, developed in 2014 by the Rice lab of chemist James Tour, carbon nanotubes are used for reinforcement. In a new research reported in the ACS Nano journal published by the American Chemical Society, Rice materials scientist Jun Lou, graduate student and lead author Emily Hacopian, and colleagues, including Tour, stress-tested rebar graphene and discovered that nanotube rebar had the ability to divert and bridge cracks that would otherwise spread in unreinforced graphene. The experiments demonstrated that the nanotubes support graphene to remain stretchy and also minimize the impacts of cracks. This could be helpful not just for flexible electronics but even for electrically active wearables or other devices in which stress transparency, tolerance, mechanical stability, and flexibility are desired, stated Lou. The mechanical tests as well as the molecular dynamics simulations conducted at the lab by colleagues from the Brown University divulged the toughness of the material. Lou stated that although the exceptional conductivity of graphene renders it a strong material for use in devices, its brittle nature is a drawback. Two years earlier, his lab reported that the strong graphene is only equal to that of its weakest link. The investigations revealed the toughness of pristine graphene to be “substantially lower” compared to its reported inherent strength. In a later study, the lab discovered that molybdenum diselenide, another two-dimensional material of interest to scientists, is also brittle. Tour approached Lou and his team to perform similar investigations on rebar graphene developed by spin-coating single-walled nanotubes onto a copper substrate and growing graphene on top of them through chemical vapor deposition. For stress-testing rebar graphene, Hacopian, Yang, and collaborators had to disintegrate it to pieces and measure the applied force. The lab adopted trial and error method to devise a technique for cutting microscopic pieces of the material and mount it on a test-bed for use with scanning electron and transmission electron microscopes. Although rebar did not protect graphene from eventual failure, the nanotubes slowed down the process by forcing cracks to zig and zag as they spread. A force too weak to totally disintegrate the graphene led to the nanotubes effectively bridging cracks and in certain cases preserving the conductivity of the material. 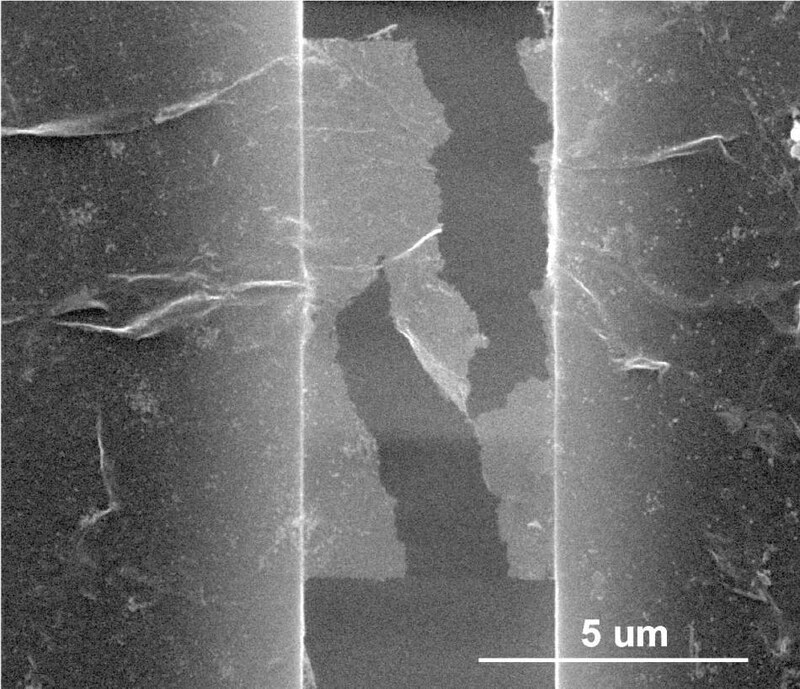 In previous tests, Lou’s lab revealed that the native fracture toughness of graphene is 4 MPa. However, the average toughness of rebar graphene was found to be 10.7 MPa. Simulations carried out by study co-author Huajian Gao and his group at Brown confirmed the outcomes of the physical experiments. Gao and his colleagues observed the same effects in simulations with regular rows of rebar in graphene as those measured in the physical samples with rebar pointing in all directions. He stated that the results of the rebar graphene are a first step toward the characterization of various new materials. “We hope this opens a direction people can pursue to engineer 2D material features for applications,” stated Lou. Hacopian, Yingchao Yang of the University of Maine, and Bo Ni of Brown University are the co-lead authors of the paper. Co-authors are Yilun Li, Hua Guo of Rice, Xing Li of Rice, and Zhengzhou University and Qing Chen of Peking University. Lou is a professor of materials science and nanoengineering at Rice. Tour is the T.T. and W.F. Chao Chair in Chemistry and a professor of computer science and of materials science and nanoengineering Rice. Gao is the Walter H. Annenberg Professor of Engineering at Brown. The Welch Foundation, the Air Force Office of Scientific Research’s Multidisciplinary University Research Institute, the Department of Energy Office of Basic Energy Sciences, the National Natural Science Foundation of China, and the National Science Foundation supported this study.